Gold and silver rebounded from losses last week. Weekly sales were stronger for US Mint silver coins. 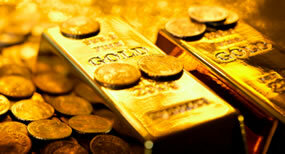 A turnaround in gold and silver on Friday buoyed prices up for the week. In seesaw daily action, the two precious metals flipped from settlement losses to following session gains. On Friday, gold for August delivery rose $9.80, or 0.7%, to finish at $1,387.60 an ounce on the Comex in New York. That brought prices into the win column for a weekly increase of $4.60, or 0.3%. "(Gold) cannot break below $1,370 and cannot break above $1,420," Reuters quoted Afshin Nabavi, head of trading at MKS. "There seems to be very good buying around the lows and good selling around the highs." "The Fed meeting next week has kept a lot of people on the sidelines," he said. "We may have some moves next week after the FOMC (meeting)." End-of-week surveys often cited here diverge in overall expectations for gold prices next week. "In the Kitco News Gold Survey, out of 36 participants, 23 responded this week. Of those 23 participants, 15 see prices up, while six see prices down and two see prices moving sideways or are neutral," reports Kitco. "Those who see higher prices said they expect gold to bounce slightly after holding the bottom end of the established range, which is roughly from $1,375 to $1,425 an ounce… Those who see weaker prices said they expect gold to test the downside because there’s little reason for gold to rise." Bloomberg’s gold survey is weighted bearish for the first time in a month. Eighteen participants expect lower prices with 14 bullish and 4 neutral. Gold prices are well lower in 2013. The precious metal has given up $288.20, or 17.2%, from its final closing in 2012. Silver for July delivery surged 37.1 cents, or 1.7%, to close at $21.94 an ounce. As a result of gains on Friday, silver prices returned to the black this week and picked up 21.1 cents, or 1%. Platinum was nearly unchanged Friday with the July contract up 30 cents to $1,447.40 an ounce. The precious metal plunged 3.7% this week. Palladium for September delivery inched up 65 cents, or 0.1% , to $731.70 an ounce. It suffered a weekly loss of 3.9%. As for the year and despite the week’s heavy fall, palladium is still 4% higher. Off by sizable amounts are silver by 27.4% and platinum by 6.2%. In weekly changes, gold edged up 0.4% while precious metals with losses stacked to 4% for silver, 3.8% for platinum and 3.4% for palladium. Gold coins advanced 7,500 ounces after jumped 21,500 ounces in the previous week. Splits were 5,000 ounces in 22-karat American Gold Eagles and 2,500 ounces in 24-karat American Gold Buffalo coins. Silver coins gained 881,500 ounces against the prior week’s 822,000 ounces. Splits were 846,000 ounces in American Silver Eagles and 35,500 ounces in America the Beautiful Five Ounce Silver Bullion Coins. Most of the ATB sales came from the new Perry’s Victory coin. The following are daily, June and year-to-date bullion coin totals as provided by the United States Mint. In related coin news, bullion American Gold Eagle coins are produced at the U.S. Mint facility at West Point, New York. Check out these West Point Mint gold bars that are used to produce the bullion coins. Melt values of silver coins are falling this month based on London silver fixings, mostly due to the latest declines this week. The following table shows melt values of older circulating U.S. silver coins. Values are based on the London silver Fix prices at the end of 2012, on May 31 and on June 14. For reference, melt values of newer bullion silver coins are also provided. Visit our sister site for always current coin melt values.